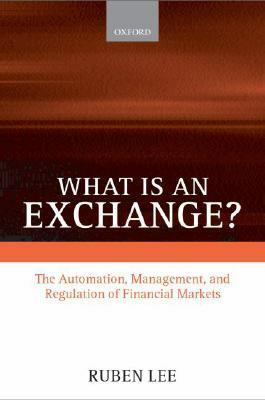 Here, Ruben Lee examines the question of what an exchange is, using arguments from both financial economics and law, and sets out a view of how exchanges might be regulated.Lee, Ruben is the author of 'What Is an Exchange? The Automation, Management, and Regulation of Financial Markets', published 2000 under ISBN 9780198297048 and ISBN 0198297041. Loading marketplace prices 86 copies from $1.98 How does the rental process work?